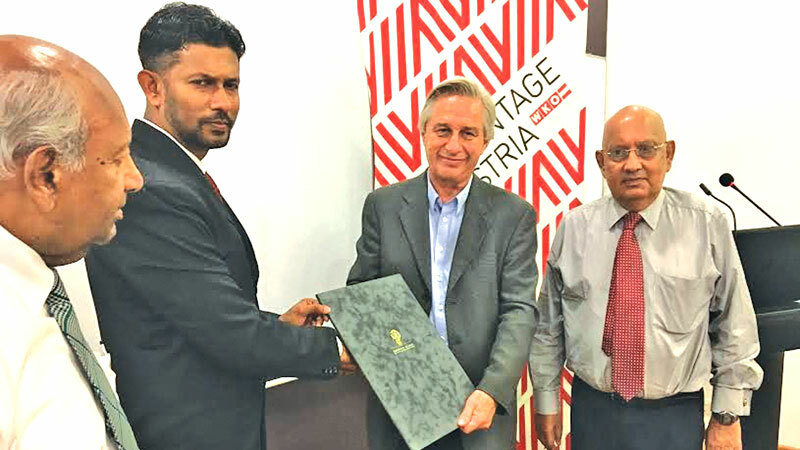 The Austrian Foreign Trade Centre (Austria Advantage) in partnership with the European Chamber of Commerce of Sri Lanka (ECCSL) had jointly organized a ceremony to felicitate of Moratuwa University Senior Lecturer Dr. Rangika Halwatura on his achievement as the winner of the Energy Globe Award 2016 in Sri Lanka. This award was designed to provide recognition to a research project with a sustainable solution. Dr. Halwatura's research was on Mud-concrete blocks which have been developed to incorporate both the strength and durability of concrete into mud-based constructions while at the same time having little impact on the environment. It is truly a sustainable initiative for a sustainable future. Dr. Halwatura was awarded with a winner's certificate for a great initiative which contributes to mitigating the environmental damage. People around the world, with a passion for finding sustainable solutions for the most pressing environmental problems such as combating resource scarcity, air and water pollution, erosion, climate change or over dependence on fossil fuels, engage in research. Due publicity and recognition has not been sufficiently generated to these solutions and in most cases they often remain unheard of. Energy Globe gives them a voice and presents them to a large audience in order to make them visible and encourage others to come up with their own innovative solution. With 177 participating countries, projects from all over the world are submitted, ranging from small and simple initiatives to large scale high-end ones. The national winners of the Energy Globe Award were published under the patronage of UNESCO and in cooperation with UNEP at www.energyglobe.info on June 5, the UN World Environment Day. On this date, a global awareness raising campaign was started for best practice projects which help to save the planet.